I'm normally not a whole wheat flour kind of girl, but lately I have been loving baking with King Arthur white whole wheat flour. 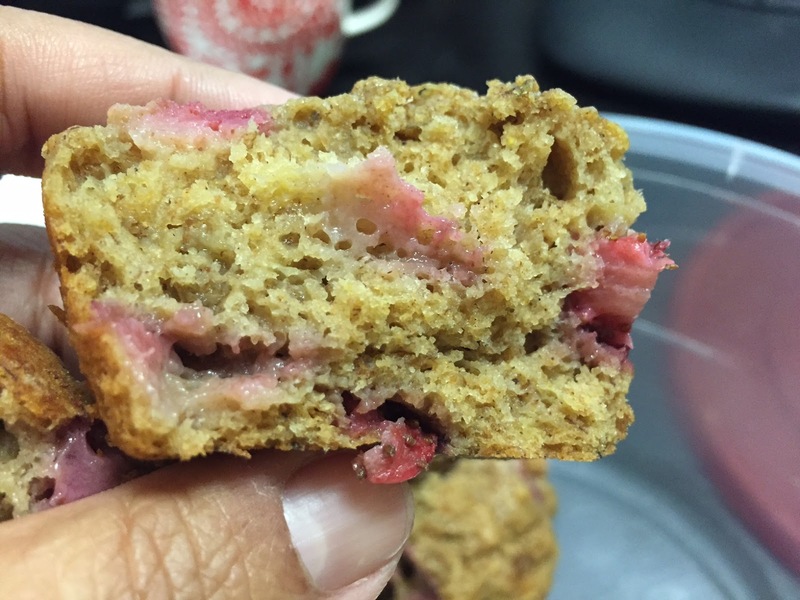 I've found that baked goods made with whole wheat flour can have an overwhelming "wheat" taste and sometimes the texture is off (ie dry). I didn't have that same issue using the white whole wheat flour. You can still taste the flavor of the wheat, but it's not as dominant and is actually pretty complimentary in this recipe. The key to this recipe ? Make sure your bananas are overly ripe. They should look black and feel mushy, that's when you know they're perfect for baking. I also recommend placing the chopped strawberries on a paper towel to take away a bit of the moisture. 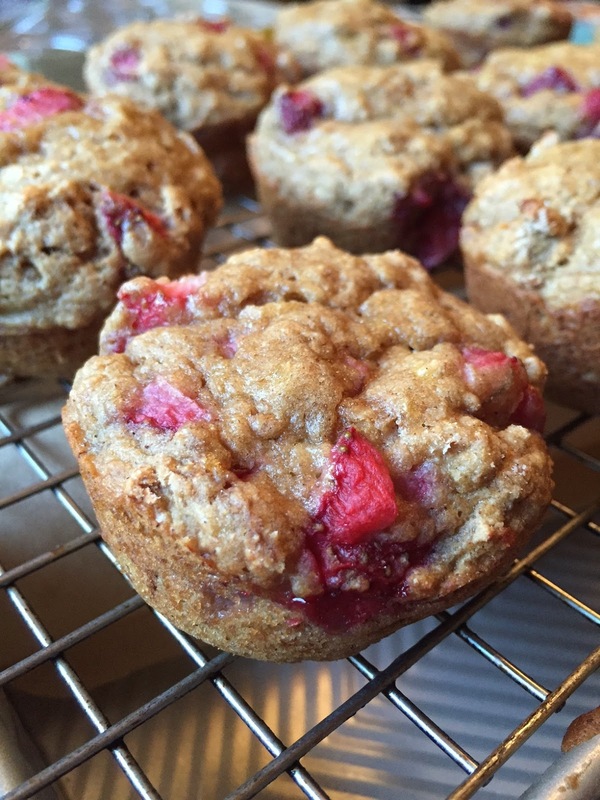 Sometimes baking with strawberries can weigh the batter down due to the moisture. Preheat oven to 350F. Spray a 12 cup muffin pan with non-stick cooking spray. In a small bowl, whisk together the flour, baking powder, baking soda, salt and cinnamon. Set aside. Place the bananas in a large bowl and mash them with a fork. Add the melted coconut oil, egg, light brown sugar, vanilla extract and yogurt. Whisk to combine. Add the dry ingredients to the wet ingredients and stir/fold lightly with a rubber spatula just until the dry ingredients are just about incorporated into the wet ingredients (a few remaining streaks of flour is ok). Add the chopped strawberries and fold gently with a rubber spatula. Fill the muffin cups with batter and bake for about 20-22 minutes or until muffins spring back when lightly touched on top and toothpick inserted in center comes out clean. Place the pan on a wire cooling rack and cool the muffins in the pan for about 2 minutes. Remove from pan and place directly on wire cooling rack. 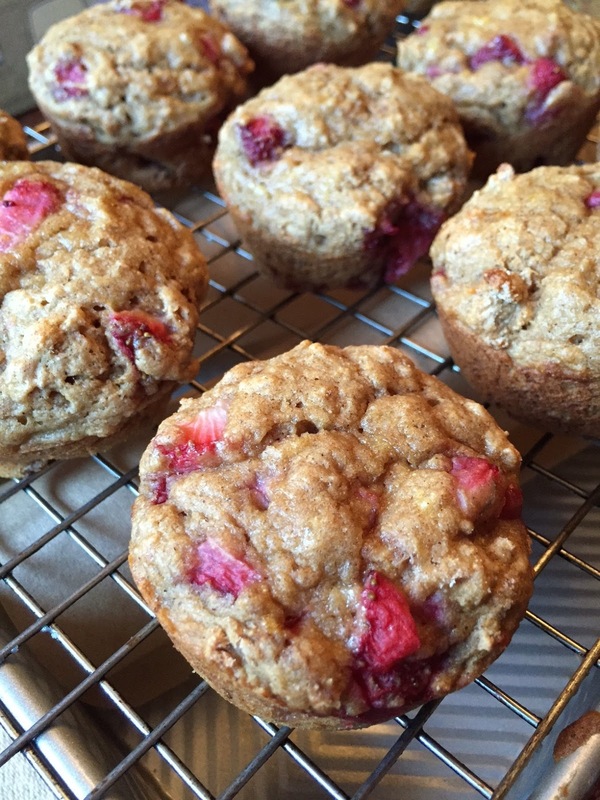 These muffins are best eaten fresh. Store leftovers in an air tight container at room temp for up to one day. Spring is here, the sun is shining (well at least here in Southern California it is) and the flowers are in bloom! What could be better? Umm....cookies of course! The theme for this month's Creative Cookie Exchange was Traditional Spring Cookies from Around the World. 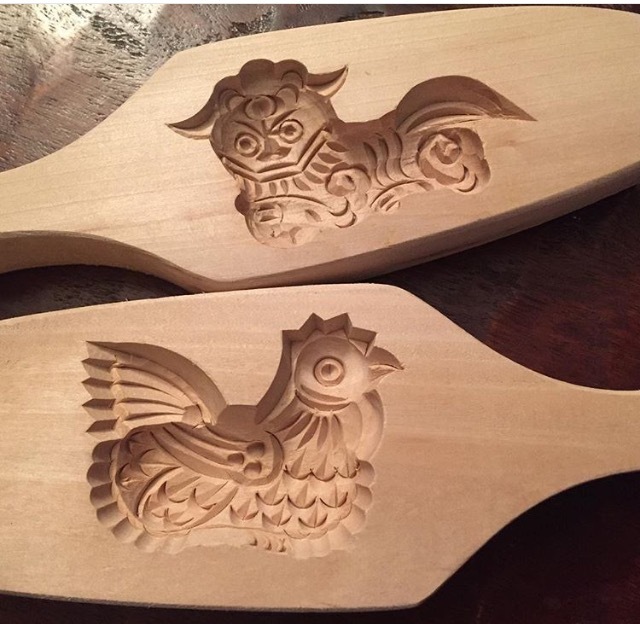 Originally I wanted to post a recipe for Chinese Spring Festival (also known as Chinese New Year or Lunar New Year) Moon Cookies. It is traditional to eat Moon Cakes during this time of year, but I wanted to make them in cookie form using these beautiful moon cake molds. 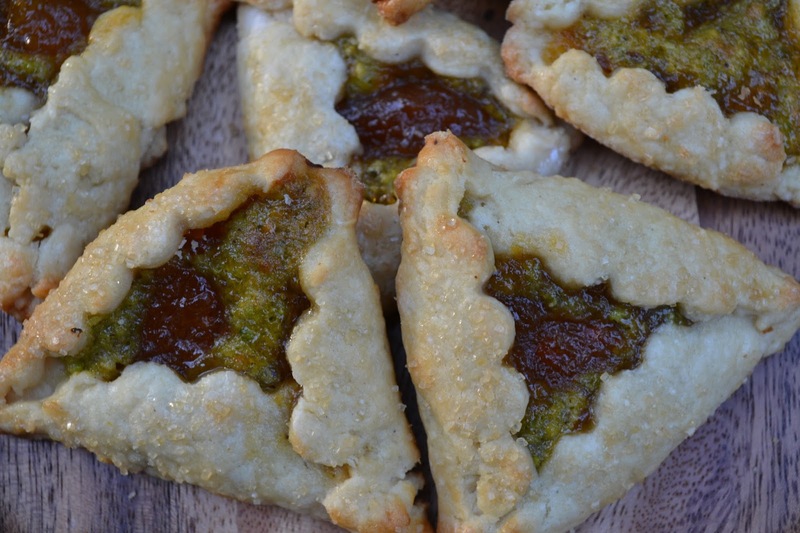 So operation "Plan B" was Hamantaschen, a Jewish cookie traditionally eaten during Purim. 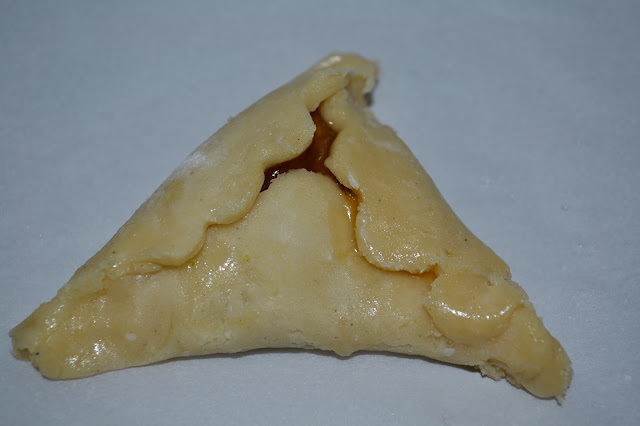 I have never had Hamantaschen before, but I've always been intrigued by the traditional triangular shape and the wide variety of flavors. 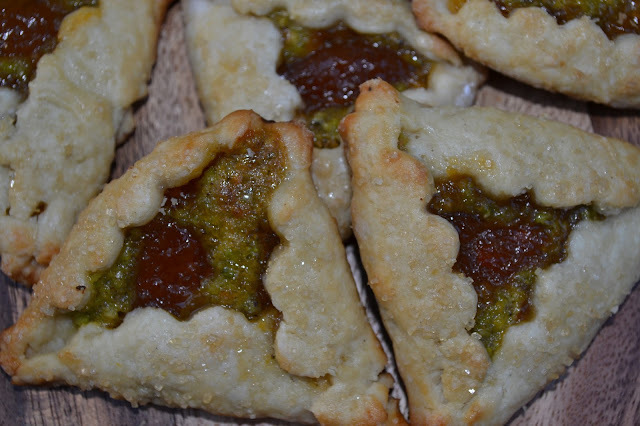 I decided to take this traditional Jewish cookie and give it a twist with Pistachio Frangipane and Peaches! Normally frangipane is made with almonds, but I wanted to use pistachios for a more unique flavor and also for the beautiful color it would give to the cookies. 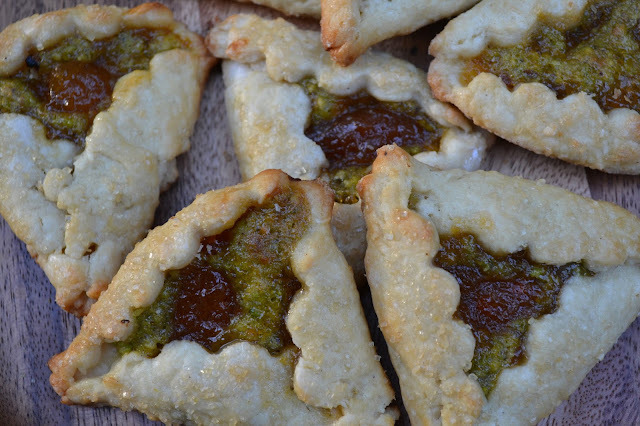 I added cardamom to the cookie dough to compliment the peach and pistachio flavors. 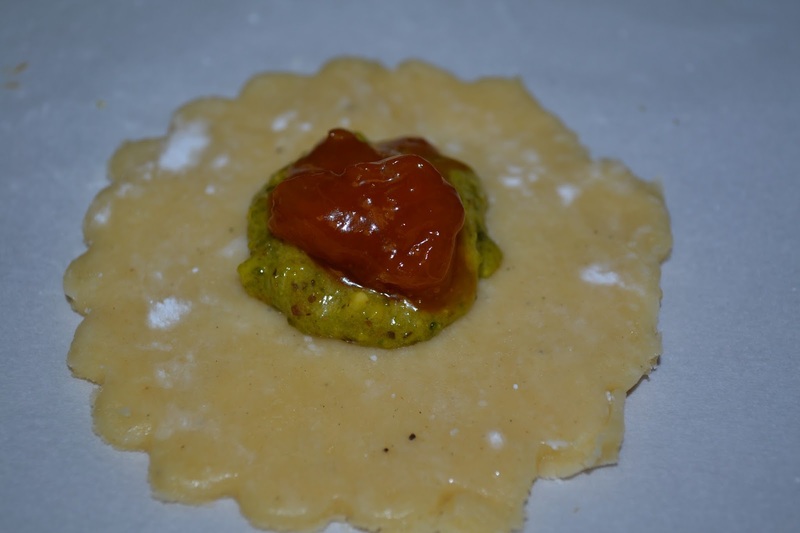 The result was delicious twist on a traditional Spring Cookie! 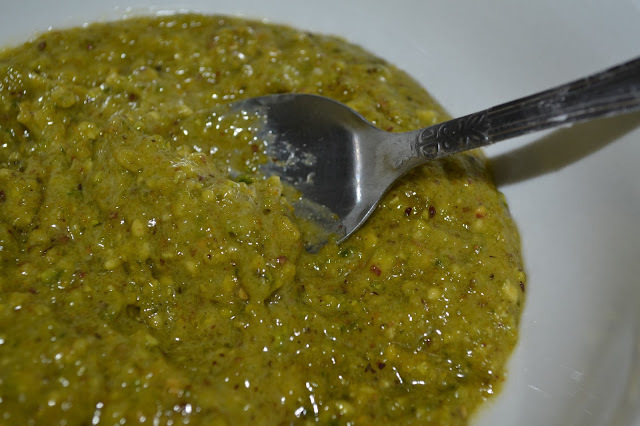 Place the pistachios, sugar, orange zest and baking powder in a food processor and process until the nuts are finely chopped. Add the butter and egg and process until you have a fairly smooth paste. Place the butter and cream cheese in the bowl of your stand mixer fitted with the paddle attachment. Beat on med-low speed until creamy. Scrape the bowl down with a rubber spatula. Mix in the egg yolk on low speed, then mix in the vanilla extract, cardamom and salt. Mix just until combined. Add the flour and pulse a few times to incorporate some of the flour, then mix on low until a dough if formed. Divide the dough into 2 disks, wrap in plastic wrap and refrigerate for 2 hours. Working with one disk of dough at a time, place the disk on a flat surface generously dusted with powdered sugar. Sprinkle powdered sugar on top of the disk, then roll into the dough to 1/4" thickness. Cut into shapes using a 3" cookie cutter. Place the disks of dough onto a parchment lined baking sheet. Place approx. 1/2 tsp of frangipane in the center of each disk, then place 1/2 tsp of peach jam on top. Using your fingertip, wet the edges of the dough with water. 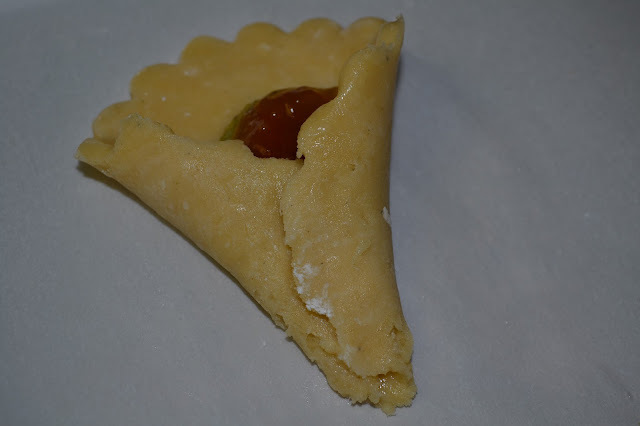 Fold one side of the dough (either the left or right) partially over the filling, then fold the other side over at an angle to create a triangular shape. Last, fold the top part over. Brush the cookies lightly with egg wash then sprinkle with raw sugar. Bake at 400f for approx. 10-15 minutes or until lightly browned. Remove from oven and allow the cookies to cool on the baking sheet for a few minutes then transfer to a wire cooling rack. 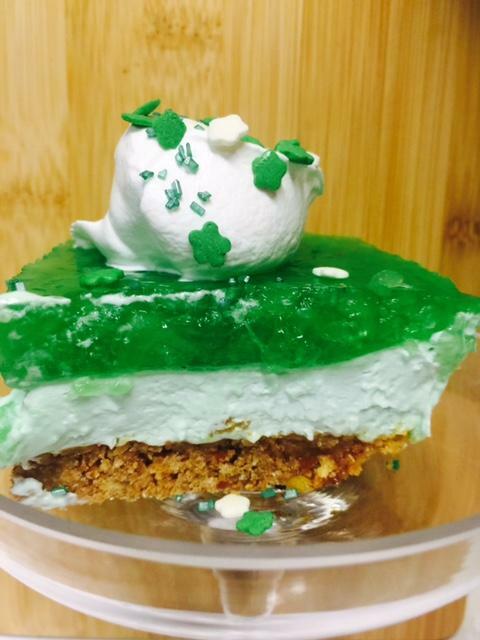 If you're looking for a delicious and easy to make dessert for the St. Patrick holiday, you have found it! 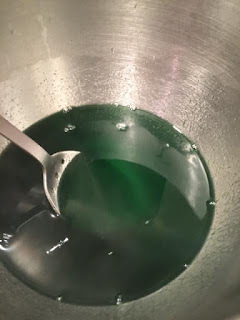 I found the base of this recipe a few weeks ago as I was searching for a good St. Patrick's Day drink. 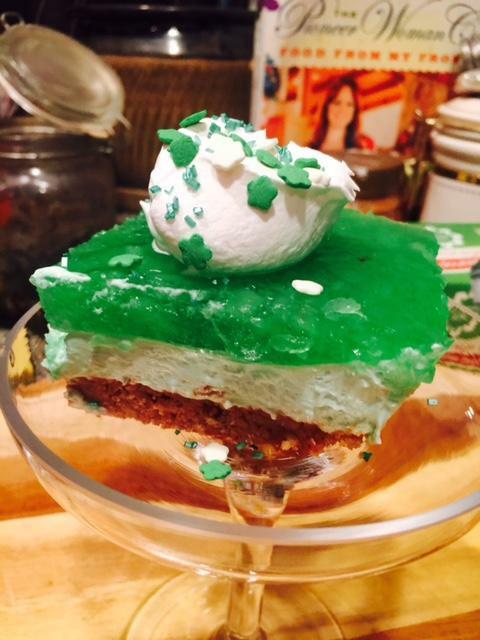 Someone had made a similar dessert, but I decided to bring it up a notch by adding coconut, rum and graham crackers. Trust me, this dessert went from good to FANTASTIC ! 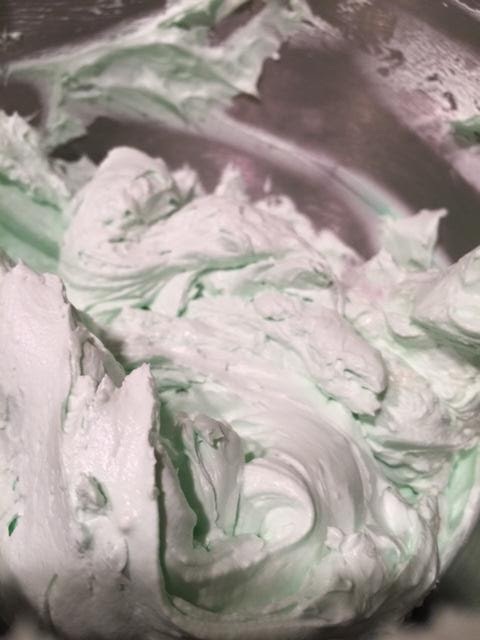 The flavors are so good....a cross between a Pina Colada and a Keylime pie! Pure fluffy heaven! I hope you give it a try! Note: While this dessert is easy to make, it does require refrigerating overnight. Plan ahead. 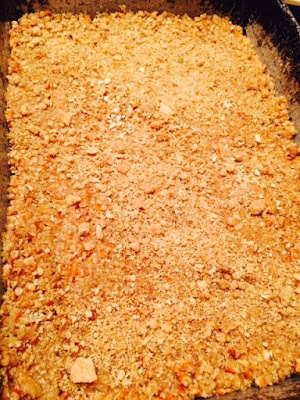 Mix together , crushed pretzels and graham cracker crumb with melted butter and sugar. Press crust mixture on a 13x9 pan. Bake for 8 minute. Remove and cool completely. 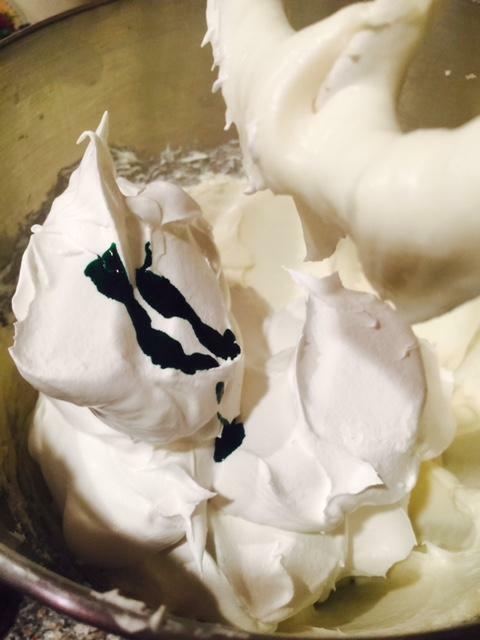 Whip together the softened cream cheese and sugar. 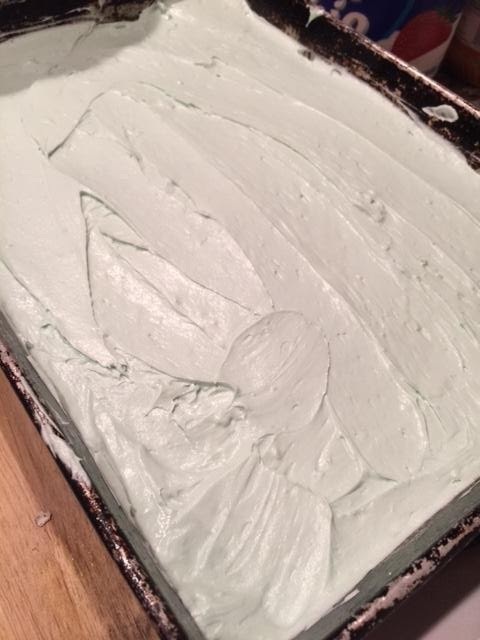 Add in 3/4 cup coconut milk and 8oz of cool whip (save the other 8oz for topping). Add 8-10 drops of green food coloring. Whip together . Spread over cooled crust. Set aside. Dissolve jello into 1 cup of boiling water. Add 1 cup of rum. Stir until complete dissolved. Add pineapples with their juice to jello mixture. Mix together. Refrigerate for about 20-25 minute till it cools and begins to set just a bit. Pour mixture on top of the coconut cream cheese mixture in pan. Refrigerate overnight. Mix 8oz cool whip with 2 tablespoons coconut milk. Spoon one tablespoon onto sliced dessert and top with sprinkles. 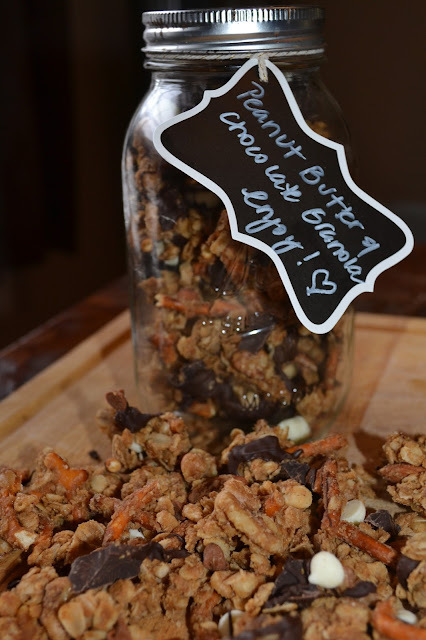 For this month's Leftover's Club I was paired with Elizabeth from Food Ramblings. 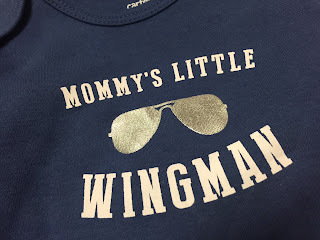 Elizabeth just had an adorable baby boy, Jonah, about 2 months ago so I wanted to send her something a new Mom would enjoy. As a mother to 3 boys, I know that new Moms are always super busy and never really have time to take care of themselves. I remember barely even having time to eat! I wanted to send Elizabeth a delicious, indulgent, somewhat "healthy" snack she could munch on while doing the million-and-one things new Moms do. That's how this granola was created. Place the peanut butter and butter in a medium size bowl and microwave until melted. Stir well to combine. Place the oats, cereal, walnuts, almonds, coconut and pretzels in a large bowl. Top with the remaining ingredients. Pour the melted peanut butter mixture over to top and mix well until combined. 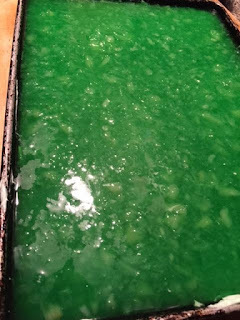 Place the mixture on an ungreased rimmed baking sheet and bake for 1 hour, stirring every 15-20 minutes. 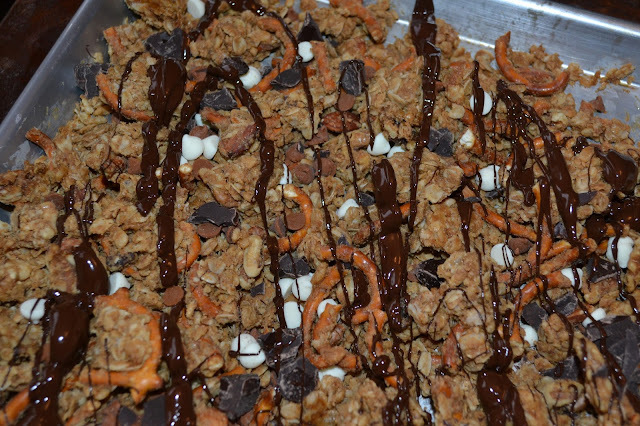 During the last part of the baking, I like to pack the mixture down to help the granola clump together during the cooling process which creates chunks/clusters when you break the mixture apart. Remove from the oven and allow to cool. Break the mixture apart into chunks. Add the cinnamon chips, white chocolate chips and 1 cup of the dark chocolate chips and toss to combine. Place the remaining 1 cup dark chocolate chips in a bowl and microwave in 30 seconds intervals, stirring well after each interval, until melted. 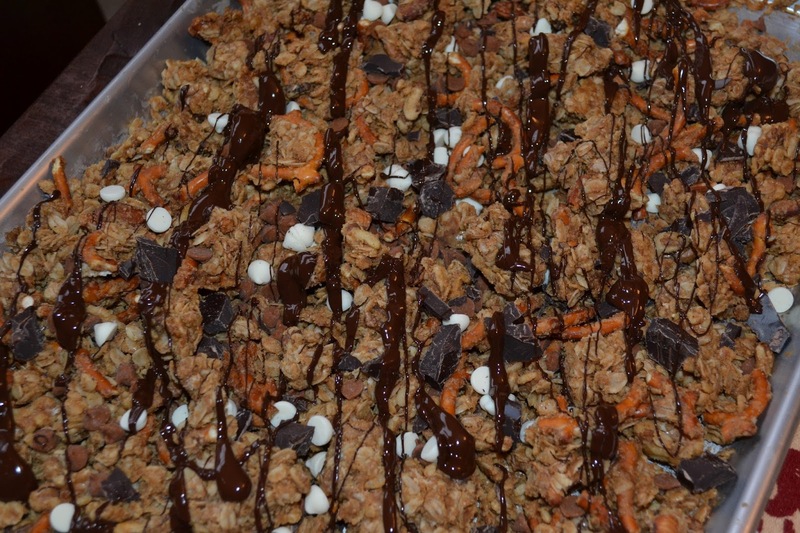 Drizzle over the granola and allow to cool completely. Store at room temp in an air tight container for 1 week.